Waited For So Long For The Delivery End Up Received Defect Stock As In Attached Of The Picture. Nice and cute. The deliveryman very good to deliver again as i missed his call at the 1st delivery. Highly Recommend Very well packed. Arrived within 5 days even though shipping notice set at 19dec. Very well packed, box within box. Very satisfied. As per photos, quality is good but delivery is incredibly slow, seems like they will only order stock from supplier upon order. Received the item in good condition and is very nice. It comes with 2 different styles/designs of straps. We're sorry that there isn't any stock of this bag now, and we could hardly tell when will it be restocked again. However, you could add the item to Wish List first. As we'll update the stock for all items everyday, you will get the notification when the item is available! Besides, we have other shoes available and you could pick them up. You'll never stop loving them! hi will u be restocking the purple one anytime soon? We're sorry that there isn't any stock of the purple one now, and we could hardly tell when will it be restocked again. However, you could add the item to Wish List first. As we'll update the stock for all items everyday, you will get the notification when the item is available! Besides, we have other bags available and you could pick them up. You'll never stop loving them! Previously the item was was $60, and after applying shop coupons and 11.11 coupons it was at $44. But now for the "black friday promotion" the price increased to double at $129.90, and you give a "50% discount coupon", the price is more than the usual $60, I think it is not very fair to deceive people into thinking it is a good buy using the 50% voucher since you doubled the original price. Q10 cart coupon is available now. You may get SGD$10 off once purchase over SGD$50. Word of advice: Don't hesitate! Our price would be updated due to the promotion and floating exchange rate. Your understanding is appreciated by us. One bag sell at $129.90? Are you serious? You may use our 50% off shop coupon to purchase this bag. Hello, may I know when will the yellow bag(Winnie) restock? 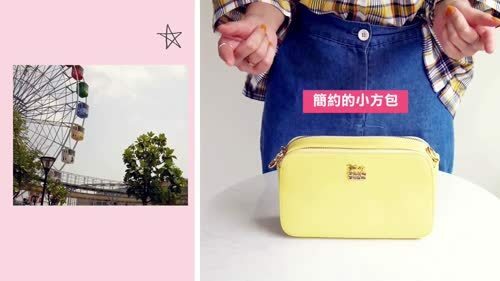 We're sorry that there isn't any stock of yellow bag(Winnie) now, and we could hardly tell when will it be restocked again. However, we have other bags available and you could pick them up. You'll never stop loving them! When will the light yellow be restocked? We're sorry that there isn't any stock of light yellow now, and we could hardly tell when will it be restocked again. However, we have other bags available and you could pick them up. You'll never stop loving them! Does the bag comes with the colorful board shoulder strap? Yes, the bag comes with the colorful board shoulder strap and it's shipped in random color.